I am one of those people who keep a bucket list–in fact, I’ve kept one since elementary school, which says something about both my love of lists and my love of travel (since, you know, travel always dominated my bucket lists). Most of the items on my various bucket lists passed from my desires without ever coming to fruition: I no longer plan on owning a herd of Huskies in Alaska (too much Balto at age eight) or spending ridiculous amounts of money on jewelry (too expensive taste at age nineteen). A few things have always been on the list, though: traveling the world. Falling in love. Reading oodles of books. 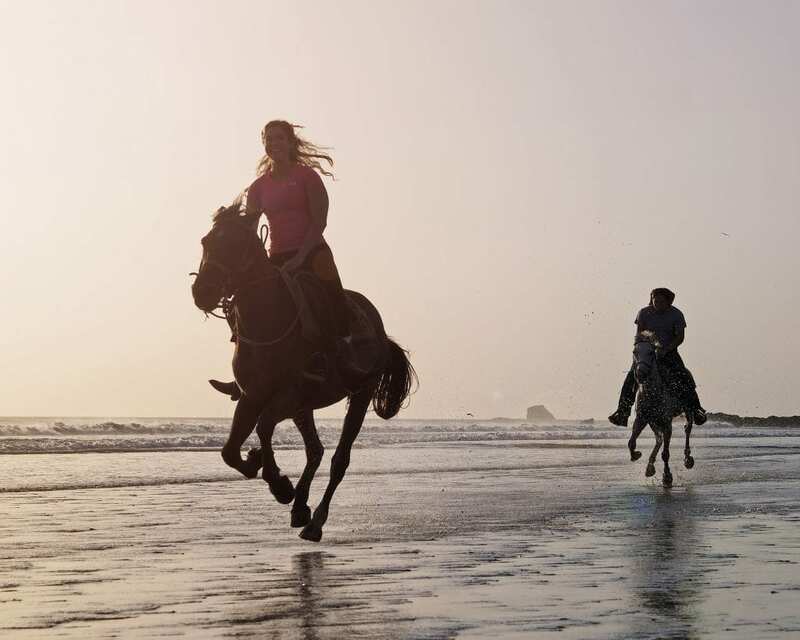 And… galloping a horse along a wild beach. At every age, the idea of galloping a horse along sand with waves crashing in the background has persisted. And finally, while horseback riding in Nicaragua, Jeremy and I knocked that one off my list. When we arrived in San Juan del Sur, Nicaragua, there was only one “must do” item on our list: a horseback ride with Rancho Chilamate. Located outside of town, the ranch boasts long, beautiful horseback rides where you get to unleash your inner cowboy or cowgirl–complete with dressing up (yes, my inner kid was thrilled). Before meeting our horses, we got decked out with cowboy hats, cowboy boots, and bandanas. For those who needed them, jeans and plaid button up shirts were also available. The second that we walked in and saw the room full of gear (not to mention the stunningly beautiful kitchen, dining room and pool–the ranch doubles as a boutique hotel that I would love to stay in one day), we knew that this was going to be far from an ordinary trail ride. After meeting our horses (Tex and Cruiser–we were in love), our group of seven headed out with our two wranglers, Phil and Claudia. 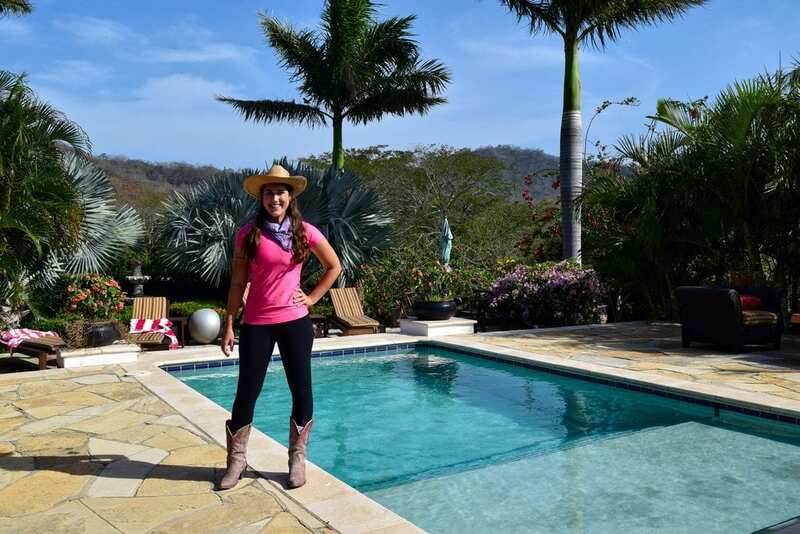 Both were expats living in Nicaragua who fell in love with the ranch–and I could hardly blame them. Our ride took us through wooded areas, along dry riverbeds, across a few streams, and through rolling hills. For the most part, the horses walked this part of the trail, though some of them were happy to speed up when climbing steep hills. The focus, though, was not speed, but the views: not only was the scenery stunning, but there were plenty of critters to keep an eye out for. We counted more than six howler monkeys along our route, including one on the floor of the riverbed, something that Phil assured us was very rare. The monkeys were incredibly cute, and captured our attention immediately–from their sweet faces to the way their tails wrap around tree branches in what I think is a completely adorable way, they were hard to tear our eyes away from. Just as adorable were the piglets running around near some of the farms, oinking and scurrying around with incredibly floppy ears. They were almost cute enough for me to feel guilty over my love of bacon. Just as we were finally starting to get hot and tired from our ride, we saw where our trail was dead-ending: the beach. To be more specific, a completely empty, wild beach, bathed in late-afternoon-not-quite-sunset light, with crashing waves of the Pacific Ocean lapping the shore. Our wranglers remarked that it was a bit hazy, and therefore we couldn’t see Costa Rica like normal–but I didn’t care in the slightest. I was too distracted by the way Tex’s hooves were making imprints in the sand, and stoked with anticipation for the speed to come. Before we started running, however, it was time for a break: we all dismounted in the shade, had a few bites of trail mix, fed a few sweets to the horses, and toasted our future galloping with rum provided by the ranch (definitely not typical on a trail ride). After a few quick safety lessons for galloping–we were ready to run. It was magical. Not only did everyone who wanted to get to gallop their horses up the beach, we got to do it four times–the horses getting more enthusiastic and worked up with each run. What could have been a five minute gimmick turned into a drawn out experience, and I loved every second of it. The feelings of wind rushing through my hair and the ocean water splashing out behind Tex and me were every bit as invigorating as I dreamed it would be as an elementary schooler. When we and the horses were good and tired (and yes, Jeremy and I were sore for days afterwards), we started meandering our way back to the ranch. Those who were so inclined also had beers passed to them to drink on the ride home, something that Jeremy thought was an excellent way to end our time on the beach. We arrived back at the ranch under the cover of darkness, hours after we first left. Waiting for us were not only more snacks and drinks (and another shot of rum to celebrate a successful ride), but a slideshow of the photos that Anne had taken of us on the beach. 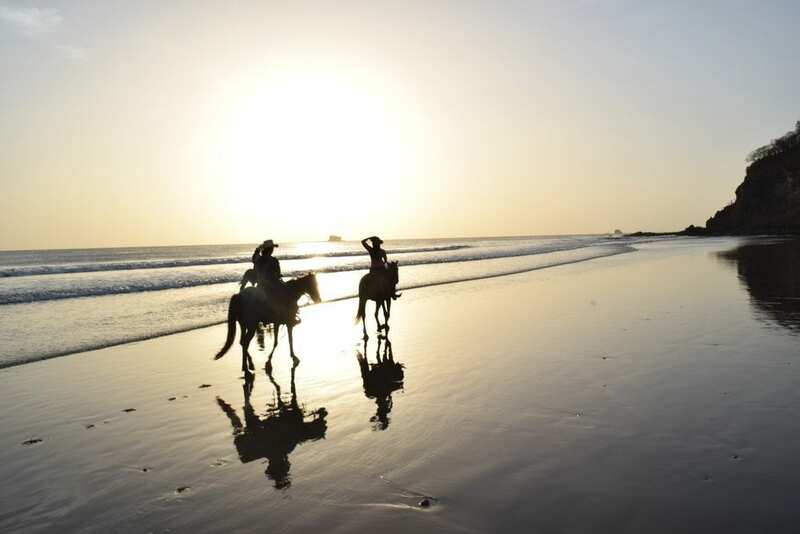 As a picture-lover, it was a huge treat to get to see photos of Jeremy and I riding on the beautiful beach–some activities are hard to get those great action shots of on our own, and horseback riding is definitely one of them. Anne did an amazing job with the photos, and to have them of such a once-in-a-lifetime afternoon is magnificent. Even better, the ranch provides some of the photos on their Facebook page for free. For any additional photos that are purchased, the proceeds go directly to a local school. 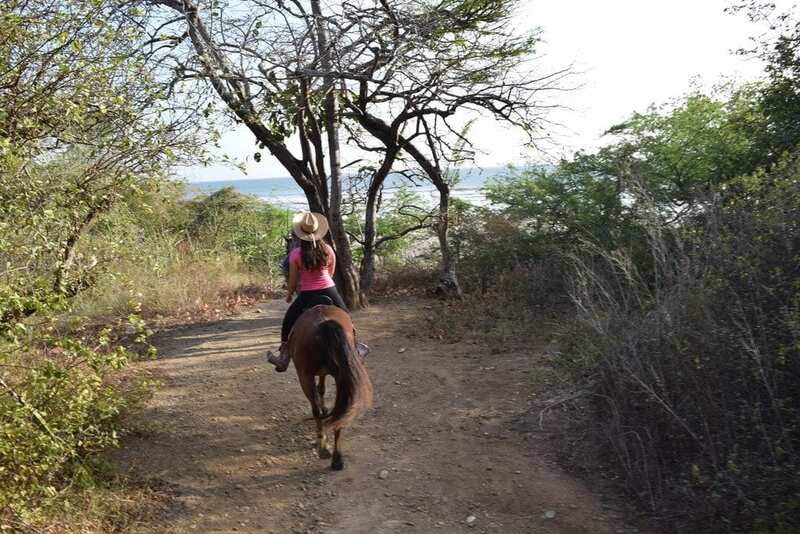 With rides starting at $75 USD/person, horseback riding in Nicaragua with Rancho Chilamate is a bit of a splurge for an excursion in Central America–but it is so, so worth it. 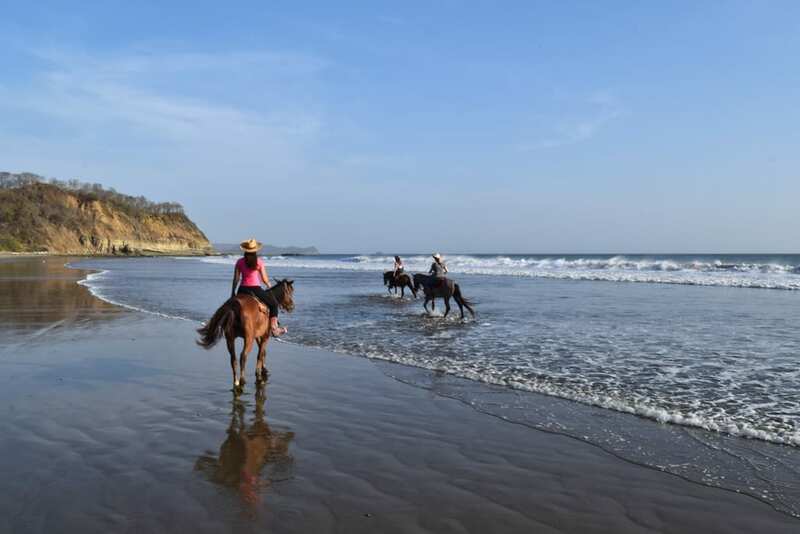 Our afternoon at the ranch was the highlight of our time in San Juan del Sur and easily one of our top ten afternoons of our last year of traveling full time, and if you love horses, you would be so disappointed to miss this. Rancho Chilamate — Come for horseback riding in Nicaragua or for a weekend. The boutique hotel that is run at the ranch is isolated, but insanely gorgeous. If you’re looking for a little luxury with the company of excellent people and plenty of horses, it’s the place for you. If you want to book a ride, we recommend booking in advance to secure a date! Contact the ranch directly to book a ride here: Rancho Chilamate. 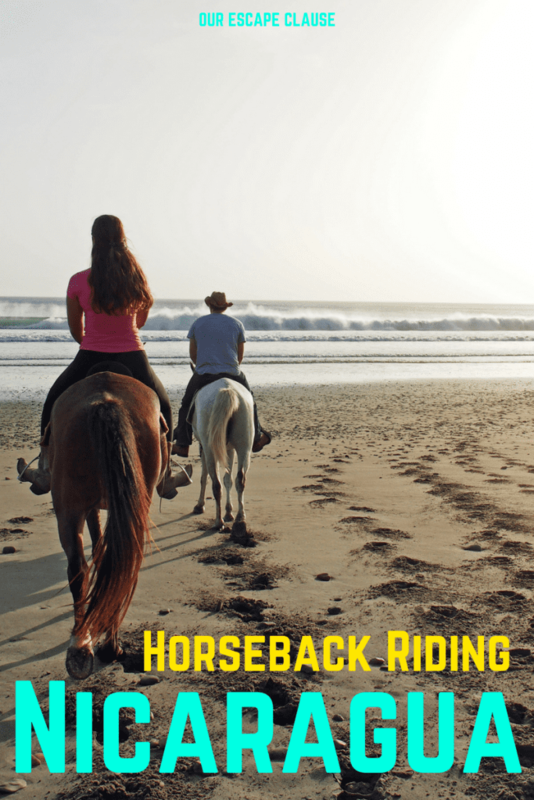 We received a discounted sunset ride with Rancho Chilamate in exchange for our review. All opinions are, as always, open, honest, and our own. I’ve always wanted to do something like this, it looks like you had a great time. The photos are so beautiful! Thanks, Jenna! We had an incredible time. If you get the chance to go, definitely do it! So fun! I wanna do it! I love that the ranch takes pictures and puts them on Facebook. It’s always great when someone else does that so you can enjoy the activity. I definitely want to do this! This is one on my bucket list to ride a horse. I want to experience riding it over while exploring such beautiful places. I love seeing the world in slow motion. It’s an amazing sensation! We love to ride, and it’s even more magical when you’re in a beautiful place.